I don't know about you, but I'm bored of the Premiership. The same old teams at the top, the massive gulf between the richest clubs and the rest. The very essence of sport is unpredictability, and even after yesterday's surprise defeat for Man Utd at Bolton, the results are simply too easy to call. What a difference to the second tier of English football, the Championship. There, everybody can beat everybody else. I was lucky enough to have been at Loftus Road yesterday to watch QPR play Sheffield Wednesday. Both teams are in the bottom half of the table, yet you wouldn't have thought it by the quality of football on show. Wednesday could have been 3-0 up after the first quarter of an hour, but QPR then took the upper hand and dominated the rest of the half. In the second half, once again Wednesday started brightest, before QPR got into their stride and started to boss the game. The match was a terrific advert for football: two teams committed to attack, playing the game in the right manner with not a dirty foul all afternoon. Brian Laws, the Wednesday manager said it was one of the best 0-0 draws he'd ever seen, I certainly can't think of a game I've been to that has finished goalless and has been so entertaining (or a game in which the woodwork had been hit so many times). Laws also said that it would have been a shame if either side had lost- when do you ever hear a Premiership manager ever say anything as sporting as that? On yesterday's performance, expect both QPR and Wednesday to finish nearer the top, than the bottom of the league. As far as I'm concerned, you can stick the Premiership and its overpaid mercenaries and prima donnas and you can stick the over-rated Champions League too. If you want to enjoy football how it used to be played- and how it should be played- check out the Championship. I'll be interested to hear from any more football fans out there who feel the same as I do. No money it seems for this. But we do have money for this. Regular readers will know all about the criminal campaign of harassment that has been waged against me ever since my critical review of a book by a pro-war hedge-fund trading blogger called Oliver Kamm appeared in the Daily Telegraph in December 2005. The campaign has taken various forms. At first Oliver Kamm published a series of posts on his blog making untrue and highly defamatory statements about me, in a blatant attempt to jeopardise my journalistic career and get me into trouble with those who employ me. Such tactics, as I've mentioned before, were not new for Oliver Kamm. Oliver Kamm's postings were then emailed under an alias to editors who commission my work, in a clear and non-too subtle attempt to stop them from commissioning me again. Needless to say, the emails were treated with the contempt they deserved, but the point was that the attempt to stop me writing was made- and has been made on repeated occassions. Another aspect of the campaign of harassment was to repeatedly vandalise my wikipedia page. One of the main culprits in thsi endeavour was a certain 'Elena Zamm'. Ms Zamm only ever edited three wikipedia pages: my page, the page of Oliver Kamm and the page of Oliver Kamm's mother. I probably don't need to tell you that Ms Zamm was far more kindly in her editing of the pages of the latter two individuals than she was with mine. One can't say that Ms Zamm didnt't take her job seriously- she was even busy editing my wikipedia page on the evening of the 25th December. Another tactic has been to post links to the blogger's defamatory postings and the defamatory postings of his accomplice, on comments threads, wherever my work appears. This happens every single time an article of mine is published online.The aim is quite clear: to try to draw the defamatory postings to the attention of readers- and the editors of the publications in question-and to try to intimidate me into quitting journalism for good. The pseudonymous posters believe they will eventually tire me out; I'll get so bored of checking websites that my work appears on for defamatory comments that I'll eventually decide there are a lot less stressful ways to earn a living. But they have, I can assure you, picked on the wrong person. The attacks, far from disheartening me, have only spurred me on. I wrote in September on how the case had now entered a new, more serious phase. The continued and repeated nature of the attacks, after almost two years, clearly constitute criminal harassment. Given the incredible malice of the persons involved, I am not surprised that despite my latest post on the matter, the attacks have continued, most recently on the website of the Spectator magazine. But those behind the harassment ought to understand one thing very well. As I said in September, I will not rest until those responsible for such cowardly, malicious and utterly dishonest attacks are standing directly opposite me in a court of law. A recent landmark legal judgement held that websites are now under a legal duty to provide the IP details and email addresses of those who post anonymously, or pseudonymously, defamatory comments about others in public forums. I suggest that the persons responsible for the campaign of harassment against me should study that judgement long and hard. In this battle, there will, I can assure you, be only one winner. I said earlier this week that I very rarely post entire articles from other writers on this blog. But this has been a special week. On Tuesday, I posted a quite excellent article from Peter Wilby on the media and the war with Iraq. And from today's Guardian, here's another gem- from Seumas Milne (above). It beggars belief that after the bloodshed their policies have caused, the advocates of 'liberal intervention' still have the nerve to call for even more military adventures. But they'll continue to do so- until we- the ordinary people who end up paying for their wretched wars- and whose children end up dying in them- say 'enough is enough'. I'm currently working on the formation of a new group, which will campaign for an end to such illegal military adventures and for Britain to jettison the doctrine of 'liberal intervention' once and for all. Such interventions- whether they be in the Balkans, the Middle East or anywhere else, have nothing to do with 'spreading democracy' or 'human rights', but are merely a smokescreen for extending The Empire and opening up new markets for global finance and western multinationals. The fightback against New Labour's fascistic ban on smoking in public places has started. Here's my piece from The Spectator on how cigar smokers are leading the way. For British lovers of La Diva Nicotina, 1 July 2007 was a black day indeed. The government’s draconian ban on smoking in enclosed public places was a blow to all puffers, but perhaps for Britain’s 800,000 cigar smokers its impact has been worst of all. However, all is not lost. After a depressing four months in which smokers, in the words of Sallyann, have been made to feel ‘like third-class citizens’, there’s light at the end of the tunnel. The fightback against New Labour’s particularly noxious brand of killjoy illiberalism is being led by the charismatic figure of Ranald Macdonald, elder son of the 24th Captain of Clanranald. Macdonald has worked tirelessly, over 19 years, to build his wonderfully cosy Belgravia club/restaurant Boisdale into an oasis for cigar smokers. Boisdale has the largest selection of Cuban cigars you’ll find in such an establishment (19 brands and over 120 different sizes and vintages). But the ban has hit business hard. ‘My sales were 15 per cent down in September,’ Macdonald told me over a Hoyo de Monterrey smoked on the little seated area outside his restaurant. ‘The evening trade has been badly affected. We have live jazz every night and jazz and cigars go together. You can listen to jazz without a cigar, but it’s somehow not quite the same.’Macdonald’s assault is two-pronged. On 1 November, Boisdale opened Britain’s first cigar terrace, a 6 x 9 metre roof area, where patrons will, once again, be able to smoke their Havanas legally. I've written plenty in the past year or so about the ever-worsening conditions for ordinary people in Hungary, where the privatising, neoliberal government of the millionaire Ferenc Gyurscany (above, left, with his good pal George W. Bush),has imposed swingeing cutbacks in state provision. But the Hungarian people are stirring: and today there will be widespread transport strikes across the country. The strikers are protesting not only about the government's plans to close large chunks of the country's railway network, but also about the planned part-privatisation of health care. There will be a big rally at Kossuth Ter at 6pm tonight. The event is being supported not only by leftist groups and unions, but also by Hungary's conservative opposition, who, to their credit, reject the heartless neoliberal dogma of the current governing coalition, and who oppose the privatisation programme. If you're reading this and are in Hungary, (I know from sitefeeder statistics that this blog does have many Hungarian readers), then please join up in these protests. The present Hungarian government is a national disgrace, and that was the case even before the Prime Minister was exposed, on tape, as a liar. Hungary- and the Hungarian people, deserve much, much better. It's very rare that I post an entire article from another writer on this blog, but this piece in today's Guardian by the former New Statesman editor Peter Wilby (above) is just so good- and so important- that it deserves the widest possible circulation. Some start of the week fun courtesy of Martin Meenagh. One of the great myths about the turbo-globalist neoliberal model is that it is "free market". The reality is that the system requires enormous state support to survive: in Britain for instance, having a privatised railway system costs the taxpayer four times more in subsidy than it did when the railways were publicly owned. And our privatised bus services are no different, next time you're in the Scottish Highlands, take a peak (from the road, because they won't let you go any nearer) at either of the two huge castles, Ann Gloag, the co-founder of Stagecoach now owns, thanks in no small part to the enormous public subsidies her company has received. (And in 2003 she was still after more taxpayers money!) A more accurate way of describing the turbo-globalist neoliberal model is to call it theft on a massive and audacious scale. And the theft is from you and me, dear reader, as it's our money that is being spent in keeping afloat the privateers, bankers and the other financial insitutions who because of the state safety cushion, are really on a no-lose bet. Just think back to the summer, when central banks in the US, UK and Europe used taxpayers money to bail out financiers who, in order to make even higher profits, had lent with incredible recklessness. Now, at last, some respected commentators are saying enough is enough, and calling for the state to take banks which it bails out- like Northern Rock- into public ownership. But this issue is not just about Northern Rock. In the interests of fairness, it's time to campaign for the adoption, by the government, of a very simple principle: not a penny of taxpayers money should be handed over to a privately owned company without the public gaining equity in that company. Here's an extract from a long essay of mine, on the parlous state of democracy in Britain, which appears in the anti-war magazine 'The American Conservative'. hotelier Basil Fawlty has to hastily improvise a menu for his guests-as the only meat on the premises is duck. Colonel Hall: Duck with Orange; duck with cherries; duck surprise. Mrs. Hall: What's duck surprise? Basil Fawlty: Er... that's duck without oranges or cherries. Colonel Hall: I mean is this all there is - Duck? Colonel Hall: And what do you do if you don't like duck? Basil Fawlty: Well, if you don't like duck... you're rather stuck. Flash forward 30 years, and the choice on offer for the British electorate has become as limited as the one which faced Colonel and Mrs Hall at John Cleese's notorious hotel. On the economy, both parties enthusiastically endorse the globalist neoliberal model, which is mistakenly described as “free market” but which in fact requires massive state support. Britain's privatised railways, for instance, receive four times more in taxpayers' subsidy than they did when they were publicly owned; it was for that very reason that the genuinely free-market Conservative transport minister Nicholas Ridley opposed privatisation in the 1980s. The Conservative's Private Finance Initiative scheme, whereby the government pays private companies to build new hospitals and schools and then leases them from those companies under lengthy contracts, has been extended under Labour, even though once again, the taxpayer ends up paying far more in the long run. Regarding the level of tax and spending there is not even the width of a cigarette paper between the parties. In the same way that the incoming Labour Chancellor Gordon Brown vowed to stick to the outgoing Conservative government's spending plans when coming to office in 1997, so Conservative Party spokesman George Osborne has promised to adhere to Gordon Brown’s plan of increasing public spending by 2 per cent in real terms over the next three years, if his party wins the next election. And although the Conservatives have recently announced that they will raise the threshold for the inheritance tax, there will be no overall reduction in the tax burden if the party comes to power. economy, Britain, following neoliberal orthodoxy to the book, has allowed the family silver to be flogged to whoever comes along. The parties are equally blasé about the spiralling wealth gap. 'New Labour is intensely relaxed about people getting filthy rich' said the party's ideologist Peter Mandelson in 1998, and after ten years of Labour government, the gap between Britain's rich and poor is at its highest level for more than 40 years. On foreign policy, both parties continue to sing- with gusto- from the same pro-war, pro-intervention hymn sheet (words and music courtesy of the late Scoop Jackson). Thought Tony Blair was a hawk on Iraq? Then you should have met his opposite number Iain Duncan Smith, who had wanted Saddam toppled in the first Gulf war of 1991. IDS’ idea of 'opposing' Blair on Iraq was to criticise him for waiting too long to attack. Five years on, the Tories, like Labour, are still in the grip of warmongers. Today's cosy cross-party consensus in fact has very little public support. The increasing alienation with mainstream politics is reflected by the dramatic fall in voter turnout- at the last two general elections, only around 60% of the electorate bothered to vote: compare that to a high of 84% in 1951. For the millions of Britain who are moderate social conservatives, who are sick and tired of our country being embroiled in military conflicts which are none of our business, and who would like to see the needs of people put above the profits of Goldman Sachs, the sad truth is that there is simply no one to vote for. In the Britain of 2007, if you don't like duck, you really are stuck. If you’ve never read The American Conservative, then I heartily recommend taking out a subscription, it really is one of the most thought provoking political/current affairs magazine in the US. Leftists and progressives should not be put off by the magazine's title: The American Conservative as well as opposing neo-liberal dogma and modern turbo-capitalism has also been implacable in its opposition to the neo-conservative war agenda. David Lindsay has an interesting post here on history according to Monty Python. But it's not just medieval history with which the Pythons seem to take, shall we say, a few liberties. They're not too hot on the more modern stuff either. 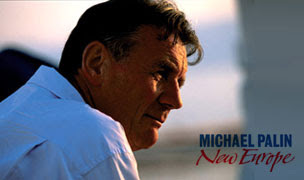 In the chapter on Serbia in his book 'New Europe', written to accompany his BBC television series of the same name, Michael Palin (above) writes that "Slobodan Milosevic, ex-President of Serbia, died of a heart attack at The Hague after his conviction for war crimes". Now, I followed the trial of Slobodan Milosevic on a regular basis. And if Milosevic was ever convicted of war crimes, my name is John Cleese. "Train passengers face routine airline-style bag checks and body searches as part of a new counter-terror crackdown announced by Gordon Brown. More than 250 busy railway stations, airports and seaports as well as 100"sensitive" installations like power stations and electricity substations will be given extra security. This could include screening luggage at major stations like London King's Cross or Manchester Piccadilly using mobile checking devices that can be moved around the country"
1. Why are all these steps necessary now, when they weren't deemed necessary during the height of the IRA's campaign of bombing on the British mainland in the 1970s and 80s? 2. Why is Britain the only country in Europe that is taking such steps? Other countries in Europe have large Islamic populations: Belgium, France and Germany, for example. Yet none of them feel the need to screen luggage at major railway stations or turn their countries into fortresses. It couldn't just be that Britain's aggressive, neo-conservative foreign policy has made us more of a target, could it? UPDATE: Railway expert Christian Wolmar has written a great response to the government's ludicrous over-reaction to the terror threat here. One of the nicest things about winning the 2007 Weblog Award for Best UK Blog is the way that traffic to this site has more than doubled. A very warm welcome to new readers: I hope you will enjoy this blog and stay with us in the weeks, months and years to come. If you just want anti-war/anti-neo-con articles and posts, you've come to the wrong place; if you want anti-war/anti-neo-con articles mixed up with sport, films, horse-racing, football and the odd You Tube comedy/music video, you're in exactly the right place. Many of the posts you will read are specially written for the blog. But I also post here many of my published articles from the various newspapers and magazines that I write for. Because of time away, a family bereavement (my grandmother died recently at the age of 100) and the 2007 Weblog Awards, I'm behind with the posting of articles of mine which have been published in the last few weeks. For starters, here's my column from last week's Morning Star, on the welcome backlash against the global chains which have done so much to destroy High Street diversity. Just compare the vibrant high streets of the towns and cities of mainland continental Europe with the main streets in any British and American city- and you’ll know what I mean. I recently spent a week travelling around Belgium, a country where, despite the enormous external pressure from big business and the think tanks that they bankroll for it to be discarded, the mixed economy ‘Rhineland’ model still holds sway. In Belgium, individually and family owned shops, bars and cafes still dominate the high streets. Despite being the base for the EU and NATO, two agents of globalisation, Brussels, the capital of Belgium, is one of the least globalised cities in the whole of Europe, with the lowest per capita number of Macdonalds, and not a single Starbucks or Pret A Manger in sight. How very different to the UK! It‘s always demoralising to arrive back home after spending time abroad and be greeted with the sight of banks, chain stores and fast food outlets which have turned our towns and cities into such soulless, homogenous places. There are those on the left who will question whether the issue of high street diversity is one they should get involved with. Does it really matter if global chains- and not locally owned businesses- dominate our high streets? The answer, most emphatically, is yes. The importance of locally- owned businesses, rooted in the community- and responsive to that community, cannot be underestimated. The owner of say, a small café in Brussels, of course wants to make a profit, but his ambitions are very different from that of a large multinational corporation. The café owner, can, if he/she wishes, give free drinks to his friends or allow regular customers to keep a slate. The atmosphere in an individually-owned establishment is entirely different - and much more personal than in a global chain. Just compare the way the nature of the British pub has changed, since large profit-hungry plcs started to dominate the industry. The friendly ‘local’, which attracted- and catered for- people of all ages, and which provided priceless social capital for many communities, have, up and down the country, been replaced by ‘vertical-drinking’ bars, where only young drinkers will feel at home. It’s no coincidence that the huge increase in binge-drinking in Britain has coincided with changes in the ownership of pubs- the big corporate chains who now dominate the market care about only one thing- profit maximisation- and that means out with the elderly drinker slowly sipping his pint of mild in the corner, and in with young drinker, who, market research tells the companies, will spend a lot more money. In Britain, opposition to high street uniformity is growing too- a leading newspaper recently launched a campaign to save London’s small shops. Well, five days on from our landslide victory in the 2007 Weblog awards, it's time for a few reflections. When it was announced that this blog had been nominated for the Best UK blog award, the opposition tried to disparage both me and the award's organisers. There was more than a whiff of anti-Americanism in the air- "fancy these out-of-touch Americans nominating someone like him- shows how much they know about British blogging" was the standard jibe. I also received some very nasty emails - which I did not publish- sneering at the fact that our share of the vote was, on day two, only around the 1% level. The reason our share of the vote was so low to begin with was I didn't even know about the award until the second day of the competition, when I received an email from The Exile. Seeing me trailing at the bottom, the opposition thought they'd put the boot in. In response to a pseudonymous commenter who asked the question "Neil who" on his blog, a fellow nominee wrote that I was the blogger "who wrote terrible things nobody agreed with". The blog of the nominee in question ended up polling 135 votes, mine polled over 1116. I believe the correct psychological term for the condition of the blogger in question is transference. When our vote started to pick up and gain ground on the leaders, the opposition started to change their line of attack. Desperate pleas for their readers to vote tactically to stop me winning were published. The result: our lead got bigger and bigger. If you want to read more about the gracelessness of the opposition's campaign, The Byzantine Sacred Art blog and the blog of Chris Paul go into further details. Five days after the competition ended not a single one of the other nominees for the Best UK blog award has had the decency to email me with their congratulations. Faced with the landslide victory of someone who they did everything they could to smear, disparage and marginalise, not just through the campaign, but throughout the last few years, the pro-war bloggers, "free market" fanatics and 'liberal' interventionists have now decided to simply ignore the poll result altogether. But enough of bad losers, sour grapes and graceless, wretched excuses for human beings. campaign. Without The Exile, I would not have known about the award until it was far too late, and I'd also like to give special thanks to Svetlana of the Byzantine Sacred Art blog for her fantastic support. What the last week demonstrated was that if we all stick together, we can achieve anything. What more can I say? 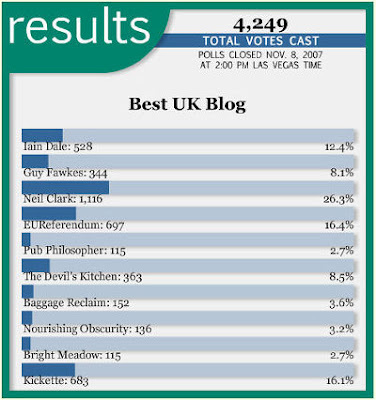 Subject to official confirmation, we have won the Best UK blog award in the 2007 Weblog Awards by a very wide margin. Our final vote toll was 1116 votes, compared to second placed EU Referendum on 697 votes, a lead of 419 votes. Many, many thanks to every single person who voted for this blog, and many, many thanks too to those blogs who supported the campaign. I will be writing a longer post about the award, and posting a full and proper 'thank you', later. UPDATE: The result in the 2007 Weblog Awards has been officially confirmed. We won it! And we won it by a landslide! You are now reading the Best UK Blog! Almost there- but no room for complacency! UPDATE: 10.15 GMT. Our lead is now 300 votes and we're now just 67 votes off the 1000 vote figure. Please keep the votes coming in! "The President of the former Soviet republic has declared a 15-day state of emergency after security units forcibly dispersed protesters outside parliament with teargas and took an opposition TV station off air. At least 500 people were treated in hospital after riot police fired gas and water cannon on crowds calling for the resignation of the president, who has been accused of corruption. The only television station now allowed to broadcast is state television." And in which former Soviet Republic are these undemocratic, dictatorial measures being imposed? Belarus, described (inaccurately) by US Secretary of State Condoleezza Rice as 'the last dictatorship in Europe? No, they are taking place in 'pro-western' Georgia, a country whose President Mikhail Saakashvili is a huge fan of NATO. So come on, Ms Rice, if you really are so concerned about dictatorships in the former Soviet republics, let's hear you denounce, loud and clear the recent undemocratic developments in Georgia. Demand that the government allows people to protest- as your department encouraged them to do in Georgia only a few years back, when the country had a different President. Otherwise, heaven forbid, people might believe that your enthusiasm for opposition street protests only extends to cases when they are protesting against governments that you don't like. We wouldn't want people to think that, would we? In the lead!- but still work to do! Well, after a great night's voting from those of you based in the 'New World', we've now pulled clear at the top of the poll, overhauling the long-time leader Kickette. But we can't afford to relax- the other blogs are sure to pull out all the stops in an attempt to catch up- so it is important that we play- and carry on voting- right up until the final whistle. As I said earlier in the week, if everyone who has voted for this blog does so on every day of the competition, we'll win. Having done so well to come from last to first, let's make sure we finish the job! Many, many thanks again for your support! UPDATE: 19.15 GMT. Well, after a terrific day's voting our lead is now up to 135. But as I said earlier, there is no room for complacency. To win the award we need the votes to keep coming in right up to the final whistle tomorrow at 10pm GMT, so please keep on voting! And once again, many, many thanks for your support! UPDATE: 21.15 GMT. The website for the weblog awards is working very slowly tonight, probably due to the heavy traffic it is receiving. A few people have written in to say that they are having difficulty in voting and that the site keeps crashing. I hope this is only a temporary problem. I'll keep the sitation monitored. Red Rum v Crisp anyone? Well, thanks to your support, we're now just 80 votes off the lead in the 2007 Weblog awards, with just over a day of voting to go. Let's hope the Weblog awards mirror the 1973 Grand National, the classic race where Crisp, having led nearly all the way, was collared in the final strides by Red Rum. This one looks like going right to the wire! UPDATE: Tuesday 22.15 GMT. Just passed Iain 'Spanish Steps' Dale into third place... just 70 votes off the overall lead. Well, we're firmly established in fourth place now, polling over 12% of the votes and with the third-placed pro-war blogger Iain Dale in our sights. If everyone who has so kindly voted for this blog over the last 24 hours does so again tomorrow and on Wednesday and Thursday, we have every chance of overhauling the leader. Once again, many thanks to all who have taken the trouble to vote, your support is hugely appreciated. You can vote here. UPDATE: 21:40. Pro-war blogger Iain Dale, clearly perturbed by the sight of us advancing in his wing mirror, has republished his original post about the awards, which has resulted in a brief surge in his share of the vote. Let's keep up the pressure on him, so please keep on voting! UPDATE: 9.00 Tuesday. It's been a great night, with our share of the vote up to over 14%. We're now just 140 votes behind the leader. Please keep the votes coming in, we can win this one! UPDATE: 17.00 GMT Tuesday. We're now up to 15% of the vote and are now just 100 votes behind the leader. Please keep voting! 94 years ago tonight, on Bonfire Night 1913, Britain's greatest ever actress, Vivien Leigh, was born. As an only child, Vivien was constantly reminded by her mother that she was special. Once when she asked why fireworks were being let off on 5th November, she was told 'it's for your birthday, darling". For those who missed it, here's my Daily Express appreciation of this wonderful actress, written to commemorate the 40th anniversary of her death in July. Weblog Awards Update: Keep the votes rolling in! Many, many thanks to all who have taken the time to vote for this blog in the Weblog Awards. We've now passed the 100 vote mark and are closing in on fifth placed Guy Fawkes. If everyone who has voted for this blog in the last 24 hours or so, does so again, every day until Thursday, we've got a great chance of winning: no other nominee has gained so many votes in the last day. So, please, please, keep the votes rolling in! UPDATE: It's been a great few hours, and we're now just 18 votes behind fifth-placed Guy Fawkes, with our share of the vote up to nearly 10%. If we keep this progress up, we can win it! Please keep on voting! UPDATE: 13.30 Monday. We've just passed Guy Fawkes (sorry to do that to you on your day of the year Guy!) and moved into fifth place, just five votes behind the fourth-placed Devil's Kitchen. Many thanks again to all who have voted for this blog, if we keep this up, we'll get there by Thursday. UPDATE: 15.15 Monday. We've just moved into fourth place, overtaking Devil's Kitchen, and are closing in on Iain Dale. Ken Bell, aka The Exile ,very kindly informs me that this blog has been nominated in the 'Best UK Blog' category in the 2007 Weblog Awards. If you enjoy reading this blog, then please go along and cast your vote here. You can vote once every 24 hours. And please ask your friends to vote too! And if that still isn't enough to get your vote, ask yourself if you'd ever see anything quite as wonderful as this on the blogs of any of the other nominated bloggers! UPDATE: Many thanks to all who have voted for this blog so far. We're now up to 7th and with five days to go I'm sure we'll continue to make progress. Remember, you can vote every day. Let's show the warmongers that they can't have everything their own way! UPDATE: Sunday morning: We're now up to 6th place. Please keep the votes rolling in! "If this government is happy to go into the next election chasing 8,000 miserable votes, then let's hear less high-flown talk about national unity, Britishness and public engagement. What voters need is a fair voting system - and something clearly worth voting for." writes Polly Toynbee in today’s Guardian.There are many things that need to be done in order to democratise Britain. Moving to a voting system in which every vote counts is one them. Here’s my Times article making the case for proportional representation, from 2004. It’s a case that grows stronger with each passing day. There are many charges to be made against the US/UK turbo-globalist neo-liberal model. It leads to greater inequality- creates social breakdown, by encouraging selfishness and materialism-and it also makes our lives immeasurably more boring. Just compare the vibrant high streets of the towns and cities of mainland continental Europe with the main streets in any British and American city- and you’ll know what I mean. In the continent, where the Rhineland mixed economy model still holds sway (despite the enormous external pressure from big business and the think tanks that they bankroll for it to be discarded), there is still high street diversity, with plenty of individually/locally owned shops, bars and cafes. But in Britain and the US, global chains dominate, destroying small business and making every high street look the same. It’s clear to anyone who values diversity, that something must be done to stop the growth of big business, yet incredibly the Competition Commission suggested yesterday that Britain needs even more Tescos and other supermarkets. Supermarkets destroy local business and rip out the traditional hearts of our towns and cities. We need to be banning the opening of any more supermarkets in Britain, not calling for more of them. And anyone who has any doubts on the impact supermarkets have on the life of our towns and cities, should read the words of Charles Leakey, owner of Leakey’s Bookshop in Inverness, in today's Independent. "The centre of town has been eviscerated from a commercial point of view.The heart has been torn out and most of our customers relocated to the big superstores. Before the supermarkets arrived it was a thriving, socially cohesive and a great place to be." Social cohesion? 'A great place to be?' If you're looking for either, head to mainland Europe- and not Tescopoly Britain, where everything has a price, but nothing has a value. UPDATE: If, like me you feel strongly about this issue, then please give your support to the Evening Standard's 'Save our Small Shops' campaign.